Watch our latest short, “Lost & Found”, which tells the story of 2 boys separated by the incarceration and reunited 70 years later. This short film was inspired by a wonderful exhibit at the Manzanar Historic Site’s Visitor’s Center. Our 1st 10 min short! Take a look at our first 10 min short about camp teacher Emily Light and one of her students, Lawrence Higashihara. I am sad to report that one of our interviewees passed away on Tuesday. Hifumi Okazaki shared many stories of his father’s work on the railroad as well as his own time in the Military Intelligence Service during WWII. I know it has been a long time since I have posted here! 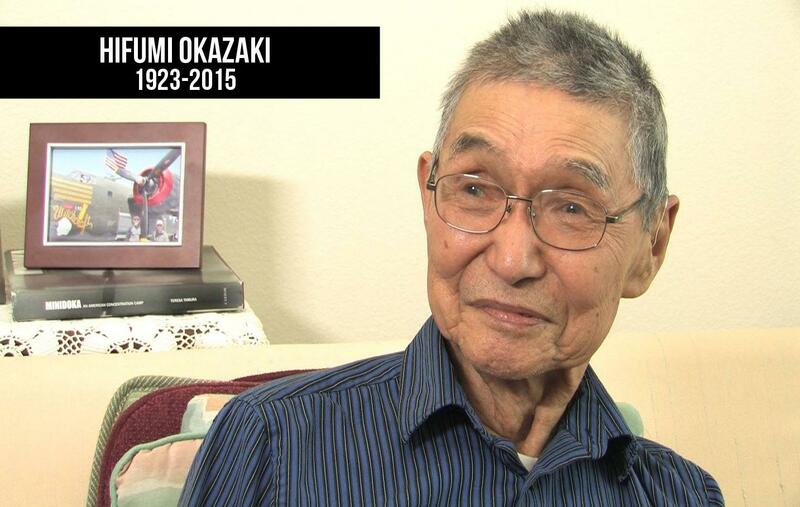 This site has become solely for our Japanese American documentary. Don’t worry, we’re still working on it! There is a new website set up for the documentary production company, Hapa Yonsei Productions. Here I will post information about all the projects we are working on. The following is a letter to the editor published April 22nd. “A recent article in the Sacramento Bee told of protests against a New Jersey auction of Japanese American artifacts from World War II internment camps. A spokesperson compared camp prisoners to Holocaust victims, American slaves and displaced American Indians. I’d like to shed a little light on that. World War II Japanese American internment camps provided privacy for families, hot and cold running water, gardens, three meals a day, medical care, freedom to move about, social clubs, entertainment, Scout troops, craft shops, athletic teams (with equipment) and warm clothing. Slaves and the victims of the Holocaust did not have those luxuries and American Indians were forced to leave their homes and burial grounds. And let me tell you about my grandparents who were interned by the Imperial Japanese army in the Philippines for three years. Beatings, mutilations and killings were de regueur. No food was provided for the first six months and then it was livestock field rice with weevils and soup with fish heads. Women were separated from men and given a 3-foot by 6-foot space on the floor to call their own. Three squares of toilet paper were allowed. No radios or cameras were permitted, on pain of death if discovered. Abortions were demanded of any woman who became pregnant. In the end, my grandfather was killed and my grandmother lost her arm from a Japanese bomb that exploded near them. Nothing like that happened to interned Japanese Americans and we even gave them each $20,000 as an apology. After the war, they were able to rebuild their lives and fortunes. I’m still waiting for the Japanese government to apologize to families of the Allies whose lives they ruined with their atrocities in the Far East. This letter to the editor was posted in regards to the protest involving Japanese American art/artifacts being sold at auction. While I cannot respond to the writer personally, I feel I need to respond somehow for those who may share the same uninformed opinions as the writer. I do not feel that most Japanese Americans would say that the incarceration was on par with the Holocaust or slavery or Native Americans. We understand that those parts of our history are horrifying and what happened to the victims should not ever be downplayed. However, just because the incarceration was not as horrifying, does that mean that it is any less important? Are we not allowed to have strong feelings about what happened to our families just because it wasn’t as terrible on some sort of human scale? I feel compelled to clear up some glaring inaccuracies in the letter for those that may not be as familiar with the camps. Those that were incarcerated were provided with food, shelter, electricity, toilets. They WERE NOT provided with gardens, entertainment, athletic teams, scout troups, craft shops or social clubs. IT WAS THE INTERNEES THEMSELVES THAT CREATED THOSE THINGS. It fills me with pride when I think about how my ancestors created a livable environment for themselves, sometimes out of nothing. THAT is why these artifacts that were going to be auctioned touched a nerve. They are a reminder of our families creativity, ingenuity and strength of will. That is why the thought of putting a monetary value on those pieces was so hurtful and why the desire for them to be in a museum where they can be shared with future generations was/is so intense. I do not want to minimize the atrocities that the writer’s grandparents suffered at the hands of the Imperial Japanese army. However I must make the distinction between the Imperial Japanese army and loyal Japanese AMERICAN CITIZENS. Should American citizens who happen to be of Japanese ancestry be punished for the acts of the Japanese army? Isn’t that what got our country into this situation in the 1st place? This is the type of thinking we as Americans cannot allow to be perpetuated.